Join us on Saturday from 4:05 PM to 5:25 PM to meet the authors of the 2014 AGM. Many speakers from the plenary, special sessions, and breakout sessions will be present during this hour to sign and discuss their books. 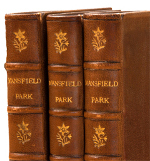 Jane Austen Books will have many of their books for sale on site.